Gerald Dempsey Posey III was born on the 27th March 1987, in Leesburg, Georgia USA, and is a professional baseball player, a member of the San Francisco Giants of Major League Baseball. Throughout his career, he has been selected for three All-Star games and awarded the Silver Slugger prize three times. In 2010, he won Rookie of the Year and was recognized as the MVP in 2012. He has won three World Series with the San Francisco Giants (2010, 2012 and 2014). Buster Posey has been playing baseball professionally since 2009. How much is the net worth of Buster Posey? It has been estimated that the overall size of the player’s wealth is as much as $10 million, as of mid-2016. 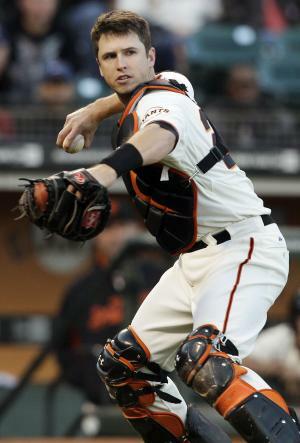 Posey studied at Florida State University, which was where he started playing in the catcher position, where in 2008 he won the Golden Spikes Award. Regarding his professional career, Posey was selected the 5th overall in the MLB Draft of 2008 by the San Francisco Giants. He was called to the majors because the starting catcher, Giants Bengie Molina, suffered an injury on 2nd September 2009, and debuted on the 11th September against the Dodgers. Posey made his first hit on the 19th September against the pitcher Jeff Weaver of the Dodgers. In 2010, Posey started the season with the Fresno Grizzlies of the League Pacific Coast Class AAA. He was called to the majors in the middle of 2010, starting the season with three RBI against the Arizona Diamondbacks. He hit the first home run of his career against Aaron Harang of the Reds. In August he became the starting catcher due to the transfer of Bengie Molina to the Texas Rangers. Buster completed the season with .305 average and 58 runs scored, 124 hits, 23 doubles, 18 home runs and 67 RBIs in 108 games, so he received the prize of the Rookie of the Year in the National League. In the middle of 2011, Posey suffered a fractured fibula and ankle ligament damage in a collision with Scott Cousins of the Florida Marlins. As the injury required surgery the player’s season ended at 45 games, batting .284 with 17 runs scored, 46 hits, 5 doubles, 4 homers and 21 RBI. In 2012, Posey returned to the Giants and had a spectacular campaign, so he was selected to the All -Star Game, led the NL in batting average with .336, won awards of Silver Slugger, the Comeback of the Year and MVP of the National League, and was champion at the World Series 2012. In 2013, Posey signed a contract extension for eight years at $167 million with the Giants, the most lucrative in the history of the franchise. Needless to say that the contract has significantly increased the total size of Buster Posey’s net worth. Moreover, he was selected for the All -Star Game in 2013, completing the 2013 season with a average batting .294 with 15 homers and 72 RBIs. In the 2014 season, Posey won his third World Series with the San Francisco Giants, and in 2015 was selected to his third All -Star Game, receiving the most votes for a catcher. At the end of 2015 he won the Wilson Award as the Defensive Player of the Year, and the next day he was awarded the Silver Slugger National League prize. Finally, inthe personal life of the player, he married his high school sweetheart Kristen in 2009, and the family has twins. They share their time between East Bay and Georgia, where they have residences.